Lomo has enjoyed great success bringing analogue cameras back into the mindset of cool photographers around the world, and with this latest instant camera, you get the fun of film, but without the long wait for processing. The Lomo Instant Wide is the second Instant camera from Lomo, the first featuring a 27mm lens and using the Fuji Instax Mini Film. This one, rather than having a wide angle lens (as the name might suggest), uses the Fujifilm Instax Wide film. There’s actually a 90mm f/8 lens (35mm equivalent), but it can be bought as part of a Combo package which has an Ultra Wide-Angle Lens attachment (21mm equivalent). The Combo package also includes a Close-Up lens, and a “Splitzer” for exposing only parts of the frame for multiple-exposure shots. Other specifications of note include a tripod mount, exposure compensation settings, a filter thread of 49mm and a lens cap which doubles up as a remote control. 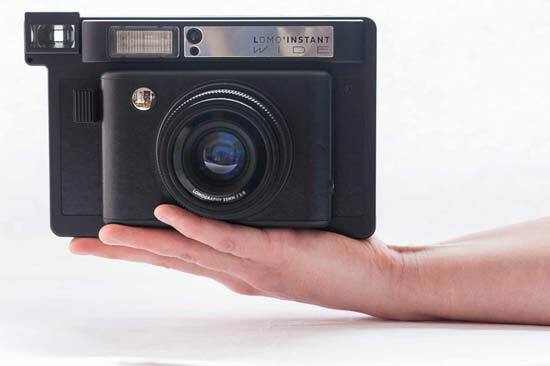 The first thing you will notice about the Lomo Instant Wide is its size. This is a very large camera, and you’ll need a reasonably large bag to accommodate it. It’s fair to say that you’ll need to set out with the very definite intention of using the camera, rather than chucking into a bag on a whim. It has to be so large to accommodate the wide Instax film cassettes. For those who are worried that installing film may be tricky, you needn’t be, as it’s extremely easy with Instax film. All you need to do is insert the cassette in the back of the camera, making sure the yellow line on the cassette is lined up with the yellow mark inside the camera. After that you need to press the shutter release button to get rid of the black slide of film which protects the cassette before you put it in the camera. There’s a small window which indicates how many shots you have left (each cassette has enough for 10 shots). Four AA batteries are also required, which can be inserted into the compartment in the bottom left of the camera. A blue light near the film counter window will light up when the battery is in a “normal” (good) condition, while it will blink if the batteries need to be changed. I’ve not had to change the batteries while conducting this test - during which around 40 shots were taken. 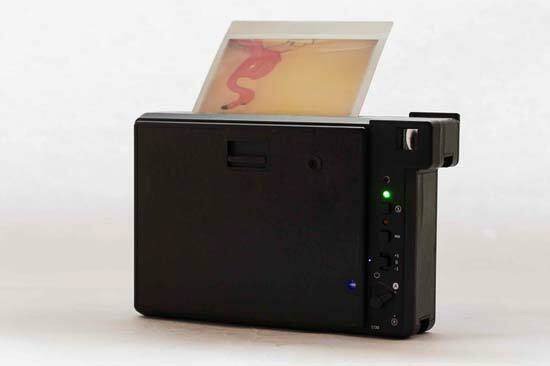 The film itself is released from a slot at the top of the Lomo Instant Wide. Once a slide is released, you’ll need to wait a few minutes for it to fully develop - you can watch this process happening in front of you or come back to it later. There’s not a huge amount of buttons on the Lomo Instant Wide, which is reflective of the fact that there’s not too many settings you can control. All of the buttons on the back of the camera can be found on the right hand side, which, with a camera as large as this is quite handy as you don’t need to stretch your hands to reach the buttons. At the bottom right, there’s a switch for moving between On, A (for automatic mode)B (for Bulb mode), and 1/30 (for always shooting at 1/30 second). If you switch to Bulb mode, the camera will start exposing when you press the shutter release button, and stop when you press it again. Lomo suggests that the A mode be used for most every day settings. When the camera hasn’t been used for five minutes, it will automatically switch off to conserve battery power. To reactivate the camera, you just need to press any of its buttons. Just above this power switch is another for altering exposure compensation. You can either leave it on 0, or switch to +1 when you want to create a brighter image, or -1, for creating a darker image. A small square button marked with MX can be pressed when you want to create multiple exposures. If you press it once, an orange light just above it will light up to indicate that you’re in multiple exposure mode. After this you compose and take shots until you’ve taken as many as you want to appear in one frame. Press the MX button again when you're done and the shot will be expelled from the slot and start to develop. 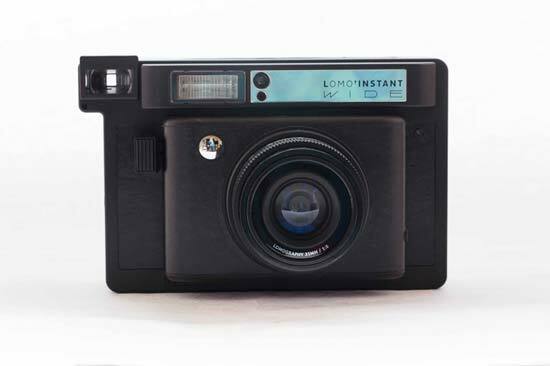 The Lomo Instant Wide’s flash is controlled by another small square button. By default, when you switch the camera on, the flash will be activated, so you have to remember to switch it off if you don’t want to use it. If you buy the Combo pack, you’ll find that there are four small pieces of coloured plastic which can be inserted in front of the flash to give colour to your images - you can choose from red, yellow, blue or purple. Or, if you wanted to, you could create a multiple exposure and switch the plastics out each time. Switching to the front of the camera, and you’ll see that alongside the lens is a small silver mirror, which is useful when you’re taking selfies to help you line up your face with the lens. The shutter release button is a large button which can easily be reached with your right forefinger when you’re holding the camera. It has a few ridges which help your finger to find it without having to look. The Lomo Instant Wide’s inbuilt lens has three different focusing zones to choose between, depending on the subject that you’re shooting. There’s 0.6m, 1-2 metres and infinity. The first is recommended for portraits, while the latter is recommended for landscapes. In order to compose the photo, there’s a viewfinder provided. However, it has no optics so it’s something you can only use as a fairly rough guide. There is a small frame inside the viewfinder which you can use to help you compose when the focusing zone is set to 0.6m, the lines are designed to account for parallax error. Otherwise, you use the whole viewfinder. If you buy the Combo package, you also get an Ultra wide angle converter and a close-focusing converter. These simply screw onto the thread on the front of the inbuilt lens. Since the angle of view is much wider with the wide-angle converter, there’s also an extra viewfinder supplied in the box - you can take out the original viewfinder and replace it with the wide-angle one very simply. Similarly, there’s also a Splitzer, which can be screwed to the front of the lens and is for use when you’re creating multiple exposures. Basically, it blocks off a portion of the lens so you can split up your exposure by moving the blinds of the splitzer after each exposure. You need to remember to make sure that MX is set to on before you start using the Splitzer though, or you’ll just end up with a semi-obscured photo. A lens cap which doubles up as an infra-red remote release is also supplied. 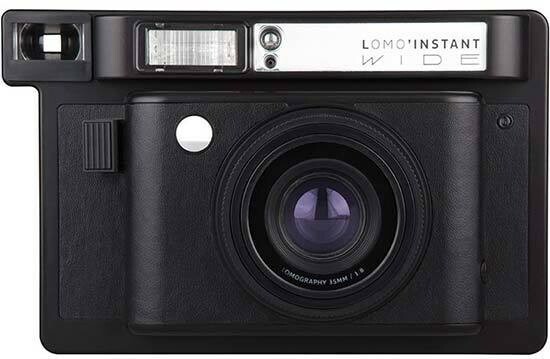 You’ll need to insert a battery into it, but you can point it directly at the Lomo Instant Wide and it will fire off the shutter release, making it ideal for selfies or group portraits. Of course, it also doubles up as a lens cap when not in use, which is very handy and means you don’t have to remember to take it with you.